I own a property in the UK that I bought alone a few years ago. Even though I had a boyfriend at the time, he had no interest in co-signing and I didn’t have much interest in getting him on board. Not that I didn’t love him at the time, but I knew it was not a property that would be good for us as a couple, as we had no long term plans in that city and I was buying something to hold for the long term. For as much as I wanted a comfy place to call home for the near future, I also bought it thinking about its rental potential once I moved away, because I knew I would. It worked out great, but buying a house alone is no small decision. That was not entirely true in my case as the boyfriend was paying a fraction of what we used to pay in our previous rental, and I took roommates as well. But if your plan is to live alone, you can only rely on yourself to pay the mortgage. Can you comfortably afford it? What happens if you lose your job, how long can you keep paying your mortgage with your savings? I am not a fan of emergency funds, but if your job is unstable by nature (freelancer, contract worker), or if your company is not doing so great and there is a small chance you may get fired in the next 2-5 years, you want to have enough to cover the mortgage while you look for another job. Some mortgages also offer job loss insurance that allows you to delay payments until you get a paycheck, and disability insurance if you become unemployable. Read the details carefully so you know what you are in for. As I said, when I bought, I was in a relationship that ended a year later. You may move in with your significant other and then be left alone to pay the full mortgage. Or you may be with someone who might get a promotion and be sent to another city in a few years. If you decide to follow along, the last thing you want is having to resort to a short sale because your circumstances change. If you relocate somewhere else, or if the place is not big enough to accommodate your future family, what will you do with your property? Can you take the risk to turn it into a rental and then proceed on paying a second mortgage for your main residence? Is your mortgage cheaper than rent? Taking on a mortgage is a huge commitment, but in some areas, it is cheaper than renting, and that is probably why you are considering home ownership. If that is not the case, then the mortgage, taxes, repairs and maintenance fees will take a bigger part of your take home pay each month. That means maybe not travelling as much as you used to, or not eating out as frequently as before. Are you ready to sacrifice that? If you are single, you probably have a vibrant social life that does include a lot of going out. Will putting that on pause affect your dating life? There are a ton of frugal dating options, and now you can entertain your friends at home, but that means a change in lifestyle. If your mortgage is a little more expensive than it ideally should be given your budget then you can always consider ways to utilise your house to boost your income. You can rent out a spare room via the hugely popular Airbnb and if you have a front drive then you can also rent that out. Which mortgage will you go for? As a single person, I think going for a fixed rate mortgage offers added security. As you progress in your career, you should be making more money, and every year the percentage of your salary dedicated to housing will diminish. However, you may be missing out on lower rates on adjustable mortgages. That is again a risk/reward scenario that you need to think about. Can you afford the mortgage if rates go up 5 points? That may happen. Mortgage rates are pretty low at the moment so fixed rate may be the safest way to go. Are you thinking about buying a place on your own, or have done it already? What would you recommend to a single person getting a mortgage? I like the idea of investing in property, but it’s a massive step so you need to be confident that you’re buying in the right area (up-and-coming rather than heading downhill) and that you’re getting a bargain (in terms of the purchase price and the ability for the property to generate cashflow above the cost of your mortgage payments). Some areas of the UK are generating a 10% yield right now, whereas others are closer to 2% which means that the cost of ownership is greater than the income. haha no mine is a modest 3 bed flat! At the current prices it rents for about 8% but as I bought cheaper I get a better yield. Being a college town I am confident I’ll always get students to rent it, even if prices drop, at least to cover the costs and slowly buy me a property. 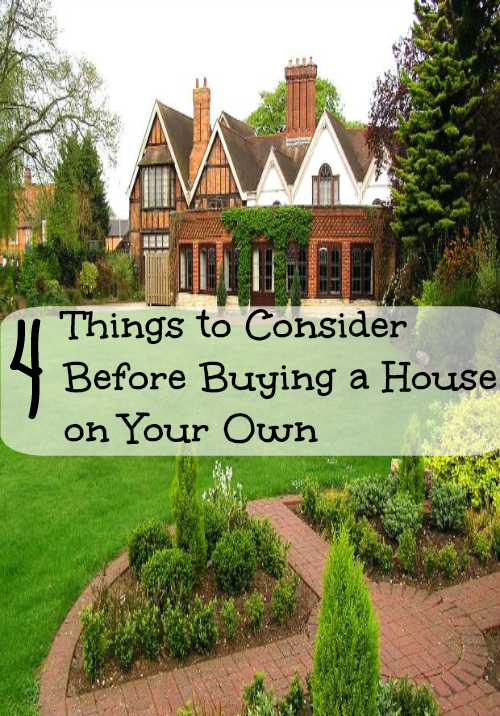 As a single female homebuyer in the past, this is a great list of things to consider. I know a few people who did not anticipate affording a mortgage alone when they broke up with their significant other with disastrous results. Ensuring you can afford the property on your salary only and having security in employment or a cash cushion were two of my main qualifiers when getting on the property ladder as a single person. Thanks Lynx. It is much easier to put yourself in a tricky situation when it is just you and your one income. The points highlighted in this article are really great. I also think its fair to mention that if you are a single home buyer, finding your social life at a bit of a loss since the purchase, deciding to rent out some of the rooms in your flat to people of a similar demographic to yourself could really help open up a new social circle for yourself, making the purchase not so much of a sacrifice! I agree it is a massive decision to buy your own home if you live alone. For many people it is unrealistic but like you many years ago I made the decision to buy alone it was a good move for me at the time. Ironically just a year later I met my wife and we ended up turning my property into a rental which worked really well! I totally agree that if a mortgage is cheaper than rent then you should buy. My only other advice is to think outside of the desired area you would like to purchase within even if its only a few miles away. Often if you spot an up and coming community you can get a better deal and then make a significant profit in the future! Thanks for the heads up that a person should be flexible enough to handle turning their current home into a rental and afford a second mortgage after ending a relationship or getting a promotion at work. In my opinion, one can have this done through a local real estate agent. With their help, they can also recommend local contractors that can help stage the home to get more renters in.